Some of the signs (or ‘syllabograms’) will look familiar, others like variations of familiar shapes. But any similarity to the Roman, Greek, and Hebrew alphabets is misleading. For example, in a nice demonstration of the arbitrariness of the sign, the first three, R, D, W, encode the sounds e, a, la. So what’s going on? While blueprint copying and modification are the most straightforward option for transmitting technology, that option is sometimes unavailable. Blueprints may be kept secret, or they may be unreadable to someone not already steeped in the technology. Word may trickle through about an invention made somewhere far away, but the details may not get transmitted. Perhaps only the basic idea is known: someone has succeeded, somehow, in achieving a certain final result. That knowledge may nevertheless inspire others, by idea diffusion, to devise their own routes to such a result. Sequoyah observed that white people made marks on paper, and that they derived great advantage by using those marks to record and repeat lengthy speeches. However, the detailed operations of those marks remained a mystery to him, since (like most Cherokees before 1820) Sequoyah was illiterate and could neither speak nor read English. Because he was a blacksmith, Sequoyah began by devising an accounting system to help him keep track of his customers’ debts. He drew a picture of each customer; then he drew circles and lines of various sizes to represent the amount of money owed. Sequoyah saw the potential for a Cherokee writing system, and began this ambitious project in a similar vein to his accounting system. Pictures, however, he found ‘too complicated and too artistically demanding’. Next he tried inventing a sign for each word, but he abandoned that approach when their quantity became unwieldy. Sequoyah realized that words were made up of modest numbers of different sound bites that recurred in many different words—what we would call syllables. He initially devised 200 syllabic signs and gradually reduced them to 85, most of them for combinations of one consonant and one vowel. is widely admired by professional linguists for its good fit to Cherokee sounds, and for the ease with which it can be learned. Within a short time, the Cherokees achieved almost 100 percent literacy in the syllabary, bought a printing press, had Sequoyah’s signs cast as type, and began printing books and newspapers. Cherokee writing remains one of the best-attested examples of a script that arose through idea diffusion. We know that Sequoyah received paper and other writing materials, the idea of a writing system, the idea of using separate marks, and the forms of several dozen marks. Since, however, he could neither read nor write English, he acquired no details or even principles from the existing scripts around him. Surrounded by alphabets he could not understand, he instead independently reinvented a syllabary, unaware that the Minoans of Crete had already invented another syllabary 3,500 years previously. Sequoyah first taught the syllabary to his six-year-old daughter, Ayokeh (also spelled Ayoka), because he could not find adults willing to learn it. He traveled to the Indian Reserves in the Arkansaw Territory where some Cherokee had settled. When he tried to convince the local leaders of the syllabary’s usefulness, they doubted him. Sequoyah asked each leader to say a word, which he wrote down, and then called his daughter in to read the words back. This demonstration convinced the leaders to let him teach the syllabary to a few more people. This took several months, during which it was rumored that he might be using the students for sorcery. After completing the lessons, Sequoyah wrote a dictated letter to each student, and read a dictated response. This test convinced the western Cherokee that he had created a practical writing system. When Sequoyah returned east, he brought a sealed envelope containing a written speech from one of the Arkansas Cherokee leaders. By reading this speech, he convinced the eastern Cherokee also to learn the system, after which it spread rapidly. Diamond’s discussion is in the context of writing systems being invented in many societies around the Mediterranean and Near East over the course of a few centuries, after many millennia of human existence without them. He suggests that idea diffusion of one type or another may lie behind their rapid spread. This in turn is embedded in broader questions of why only some societies – and which ones – developed writing, given the great power it confers. This entry was posted on Tuesday, April 2nd, 2019 at 8:11 pm and is filed under books, language, language history, linguistics, literature, writing. You can follow any responses to this entry through the RSS 2.0 feed. You can leave a response, or trackback from your own site. Unless Cherokee is sometimes written from right to left, the typist at 2:37 is using a non-Cherokee typewriter. Maybe Arabic or Hebrew? I know, I know, it’s just a cartoon! 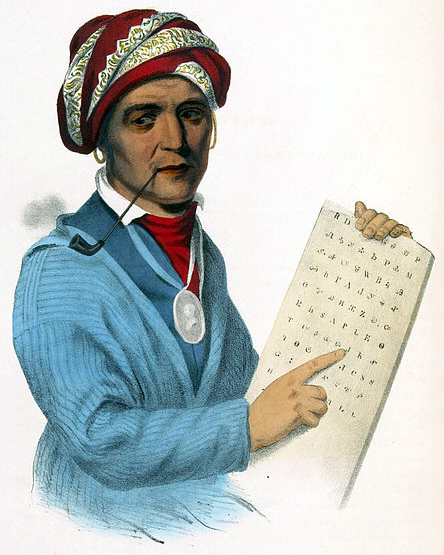 I was familiar with Sequoyah’s magnificent invention of the Cherokee syllabary, but I didn’t know how independent his invention was, or the hurdles he had to leap to get it accepted by other Cherokee speakers. Most informative. Thanks! Yes, it was a tremendous, inspiring achievement. Cherokee is written left to right. I noticed the typewriter movement but thought it too trivial to mention. Your avatar suggests a particular interest, though! I am full of admiration for anyone who can invent a written language – alphabet or syllabary. But 85/86 characters are a lot to remember. Economy of symbols is to be desired as far as I’m concerned. The big breakthroughs in mathematics became possible once a place-value system, a zero, and a decimal point were thought up, because this meant that new symbols didn’t have to be invented for ‘new’ numbers. In the same way, a writing system that has separate symbols for all vowel sounds and all consonants can put together anything necessary for any word. 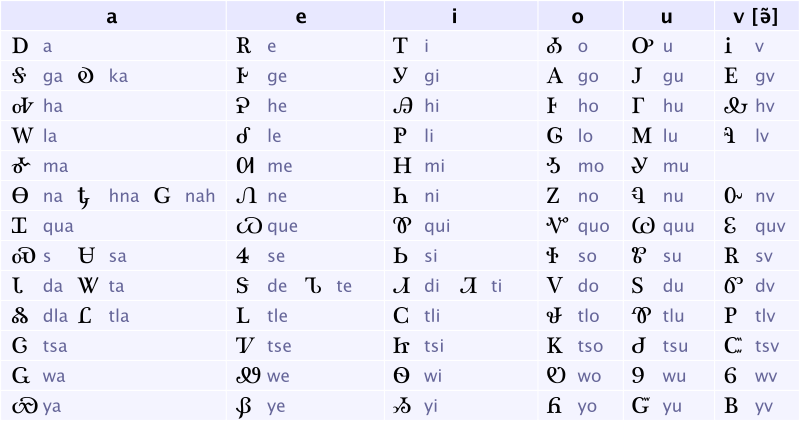 The limited numbers of vowels and consonants (apparently) in Cherokee, would require an alphabet of fewer than 25 symbols, and could cater for ‘foreign’ combinations (TWA for example) as a matter of course. Good on Sequoyah all the same. It’s easy for me to criticise from a position that takes literacy for granted. But no way could I ever match his achievement! I wondered about this too. The languages I’ve learned all use some version of the Roman alphabet, with or without diacritics. I’ve never learned one that uses logograms or syllabograms, so I can’t assess how relatively difficult they might be, how just how much the quantity of signs matters. Economy of symbols is crucial, as you say, but only up to a certain point. Certainly the Cherokee seemed to adopt Sequoyah’s system swiftly.